The beautification work was done on June 24 by 160 Torch Classic volunteers who planted 4,000 hardy grasses around the city’s distinctive metal Western sculptures of longhorn and a windmill in a large area between FM 1764 and Interstate Highway 45. 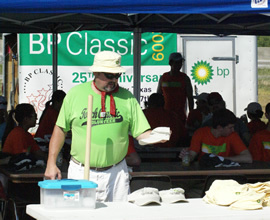 BP Texas City hosted the 25th annual Torch Classic, a four-day volunteer and athletic event with teams from BP facilities across North America. The landscaping project is among a long list of remarkable projects completed by Torch Classic volunteers, who leave a positive and lasting impact on host communities. Today, the area that BP volunteers lovingly nicknamed “Longhorn Park” comes alive as a showpiece for the Texas City community. Southeast Texas winds and sunlight tease the specially selected grasses until they mimic shimmering waves. John Amato, refinery Process Safety Management (PSM) coordinator for the Utilities group and president of the volunteers, explained how the successful public-private partnership came about. Designed with feasibility and safety in mind, the summertime project included an onsite barbeque, shade-giving tents and plenty of ice-cold water. Enthusiasm and sheer numbers reduced what would have been an 8-hour job to just 3. The sea of orange t-shirts became celebrities when they were spotted by a passing news crew from KPRC Channel 2. The sight was irresistible and became a featured story on that night’s newscast. After the volunteers finished their work, landscaping professionals came in to add agave and groupings of crepe myrtles as well as other plants that required expert attention. The project’s effect is just what the mayor of Texas City desired for the community—a showcase entrance to the city. Seventeen Proud Partner awards were given along with 15 certificates of recognition. This marks the first year in the organization’s 25-year history that awards were presented—four in all—to gateway communities outside the Houston city limits. Texas City was nominated for FM 1764 by HLS Enterprises, the landscaping company that designed and contributed to the planting of the project. All nominations are judged by the same criteria—numbers of volunteers, positive visual impact and a sustainability plan. Also, judges give higher marks when corporate involvement is present.